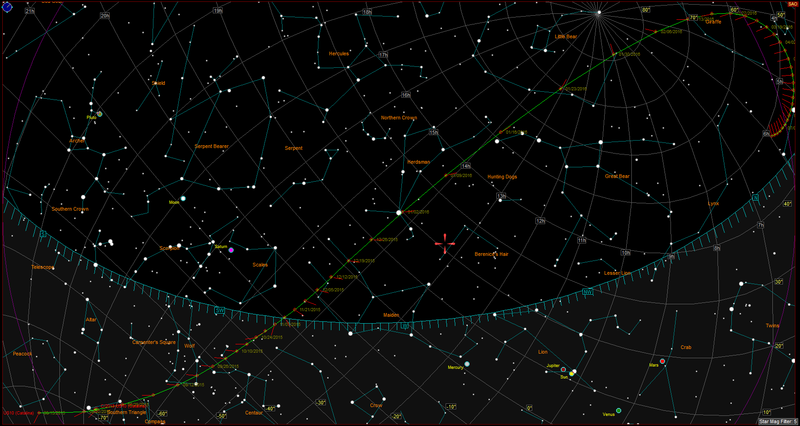 Note that a good opportunity will be around January 2nd when it will pass within 1deg of magnitude 0 star Alpha Bootis – Arcturus. Until then, people in the south keep enjoying it, I’ll just have to wait for the cold winter nights to get a peek at this comet. Comet C/2013 US10 is not periodic, but comes from the distant Oort Cloud and this will be it’s only recorded passage by the Sun. After spending millions of years slowly orbiting the outer solar reaches, it got disturbed, possibly by a nearby star and is now on an ejection trajectory; its velocity is such that it will be flung into interstellar space, away from the Sun’s influence until it’s picked up by another star. This entry was posted in Events and tagged Astronomy, Comet, Night Sky by Benoit Guertin. Bookmark the permalink.